late night blurry bottle picture: classic..! 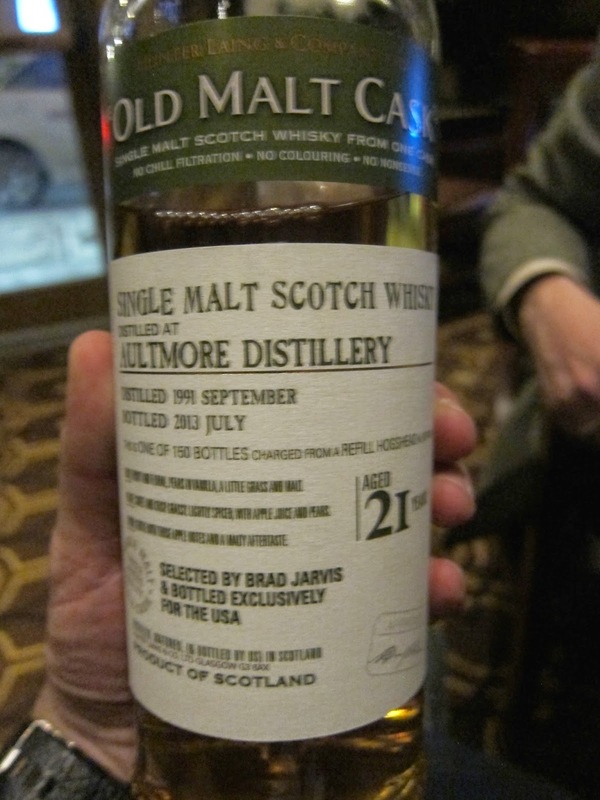 Old Malt Cask Aultmore 21yo (50.0%): Today I have another sample from International Spirits & Wines line-up we tasted last week together with Brad Jarvis and Charles Tower at The Last Hurrah. It is a single cask from Aultmore bottled by Old Malt Cask. Do you recall the hexagonal green boxes occasionally catching your eye on the spirits shelves? Yep, they are all Old Malt Cask bottlings... This particular barrel is actually selected by Brad Jarvis himself (how cool is that?) and bottled exclusively for the US market. Only 150 bottles have been made available. Like Craigellachie, The Deveron and Royal Brackla, Aultmore is one of the distilleries John Dewar & Sons is having big plans about. It looks like soon enough we will start to see the official releases of 12yo, 21yo and 25yo expressions from the distillery with fancy packaging and pretty labels on the shelves more often. And yes, exactly: God knows how expensive they would go for. That means this bottle with a price tag a little above $150 looked like a pretty good steal to me even before I tasted it. It is distilled in September 1991, aged in a refill hogshead and bottled in July 2013. Color: Very light for a 21yo whisky. Straw like, Pinot Grigio. Nose: Fresh lemon zest and vanilla lemon cookie dough. Watching your dying lawn under the sun and not doing anything about it but it smells in a certain way and breaks your heart. Table saw shavings not vacuumed for a week and unripened Bartlett pears. A few drops of water shifted the whole nose to a way greener place: Bitter greens, green malt and fresh mint leaves. Palate: Old school... Warming and dry mouthfeel. Pencil shavings, first time you take your old wool sweaters out of your closet when it starts to get cold and coarse rock salt. Shepherd's pie, green asparagus and black pepper corns. Water smoothens the salty edges a little. Green and yellow gummi bears and yellow grapefruit. Finish: Long and still warming its way down... Black pepper, more pears and (hard to believe but) more salt. Overall: Well this guy definitely doesn't behave like a 21 year old adult... It is matured and settled on one side but very uneasy and fidgety on the other. It reminded me some old Glentauchers bottlings I tasted a few years ago. I really like and appreciate these old style, not overcomplicated whiskies, but I also know that some people are more adventurous when in it comes to older drams. I understand it but I don't think you can beat a solid, simple ex-bourbon barrel finish with that citrusy warming mouthfeel. If I had to complain about anything I would do it for the abv. This whisky would be a great treat if bottled at cask strength instead of traditional Old Malt Cask strength at 50%. Thanks again to Brad Jarvis a.k.a The Whisky Professor for the sample.